Post-Thanksgiving online discounts were once relegated to Cyber Monday -- but these days, websites are launching deals even before Black Friday. And the resulting shopping frenzy is expected to set records. IBM Benchmark reported total online sales for Black Friday were up nearly 21% from last year. On Thanksgiving, sales rose more than 17% compared to 2011. Black Friday was the stronger of the two days, eclipsing Thanksgiving by 4:10 p.m. ET. And a long list of retailers -- including Wal-Mart (WMT), Amazon (AMZN), Best Buy (BBY) and Ann Taylor (ANN) -- unveiled "pre-Black Friday deals" even before Thanksgiving. Apple (AAPL) posted its one-day online shopping discounts on Black Friday, as did beauty brand MAC Cosmetics. Cyber Monday's original appeal, as the first weekday after Thanksgiving, was access to quick Internet speeds while at work. But now broadband at home is ubiquitous, and consumers can also shop on a slew of mobile devices. And so retailers' online deals stretch well ahead of Cyber Monday -- in some cases, nearly a full week before. "Retailers are trying to draw consumers in earlier, and one way to do that is to stagger the deals: Pre-Thanksgiving, some on Thanksgiving Day, another set over the weekend, and finally the big bang to close it out on Cyber Monday," Henderson said. Mobile devices have become increasingly important during that week before Cyber Monday. The number of consumers using their mobile device to make a purchase on Black Friday this year increased by nearly two-thirds from 2011, IBM data show. Apple's iPad made up nearly 10% of online shopping traffic on Black Friday this year, according to IBM, while the iPhone brought in almost 9% and Android devices comprised 5.5%. And IBM said shoppers are taking advantage of the technology to find better deals. Despite spending more overall, the average online order fell 4.7% to $181.22, and the number of items in each order decreased 12% to 5.6. Retailers are taking note. Companies like Macy's (M) and Target (TGT) developed special Black Friday mobile apps featuring exclusive deals and store maps. 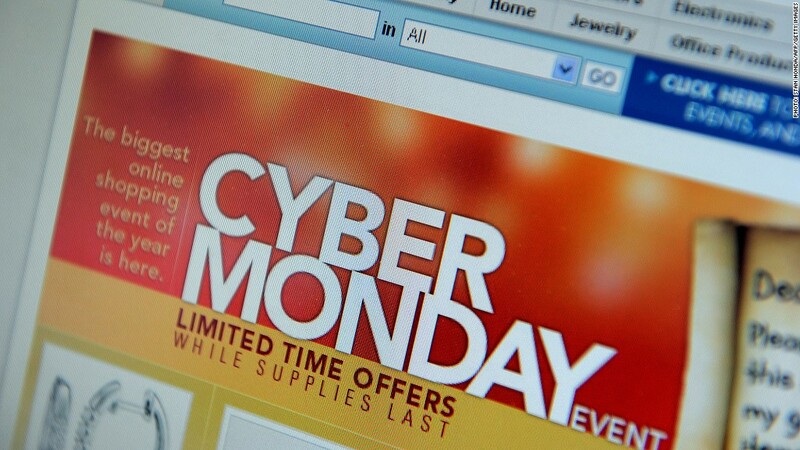 Still, despite the expanded schedule, Cyber Monday itself remains an important part of the holiday shopping season. Andrew Lipsman, an industry analyst at data tracking firm ComScore, said he expects sales for the one-day Cyber Monday shopping event to be around $1.5 billion this year. That's up from his calculations of $1.3 billion in 2011. It will be a few weeks before full details on Thanksgiving week's sales are made clear, but last year both Black Friday and Cyber Monday broke records. Total spending over the four-day weekend after Thanksgiving 2011 reached a record $52.4 billion, according to the National Retail Federation. Black Friday 2012 was shaping up to be robust, with shoppers turning out even on Thanksgiving Day at stores including Toys R Us and Sears (SHLD).